Have you inspected belts and sheaves for damage and excessive wear? Did you measured and corrected belt sheave alignment? Have you measured and corrected belt tension? 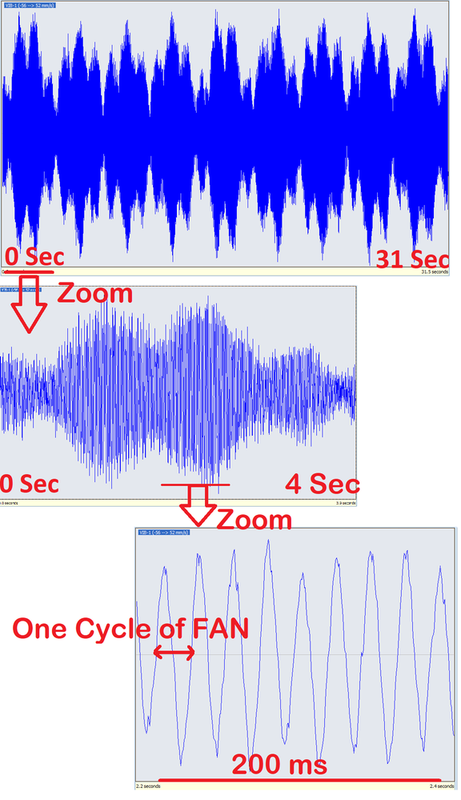 The waveform plot labeled "one cycle of fan" shows about 8-cycles per 0.2 seconds or 40-Hz or 2400 cpm. This is lower than the stated motor and fan speeds, so it may be a belt resonant frequency. Have you performed a bump test to check for resonant frequencies that may coincide with fundamental operating frequencies of your system? Also consider checking all the hold down bolts for looseness, degradation, and ensure that the washers are properly sized.